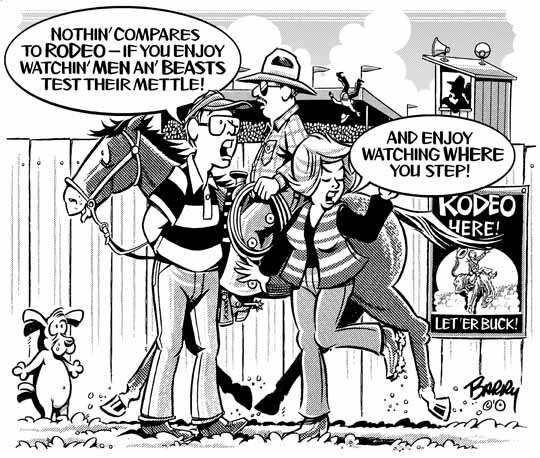 Figured I'd better get something on RODEO to you about now, since the #1 cowboy sport opens its season next week in Miles City MT — hence, this first of two RODEO cartoons. It's one that salutes non-cowboy attendees who are inclined, naturally, toward buckin' horses & their daring riders — &, simultaneously, pokes fun at others in attendance who'd rather that the more "natural" aspects of RODEO didn't get too close. I'll be posting my RODEO Category a little later today & will send you a heads-up when it happens. Today's second RODEO toon will follow shortly.